When monitoring your network environment, it is extremely important to receive email notifications properly. The Manage Email Settings page was created to allow you to manage these settings and ensure that Users are properly notified by the XI server. You can manage your Nagios XI server’s email settings through the Manage Email Settings page located in the Admin panel. Your email settings can be configured either by Sendmail, or SMTP to transmit email Alerts and Notifications for potential infrastructure issues from Nagios XI to your Users or Contacts. The ability to use SMTP as opposed to Sendmail is particularly useful if you would like to add authentication via a SMTP relay to your outgoing Nagios XI mail. 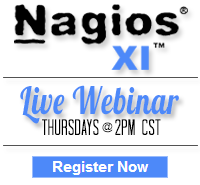 The video tutorial below shows how email settings can be modified within Nagios XI. Category: Uncategorized. Closed Tags: Administrator, Email Notifications, Email Settings, Manage, nagios xi, SMTP.